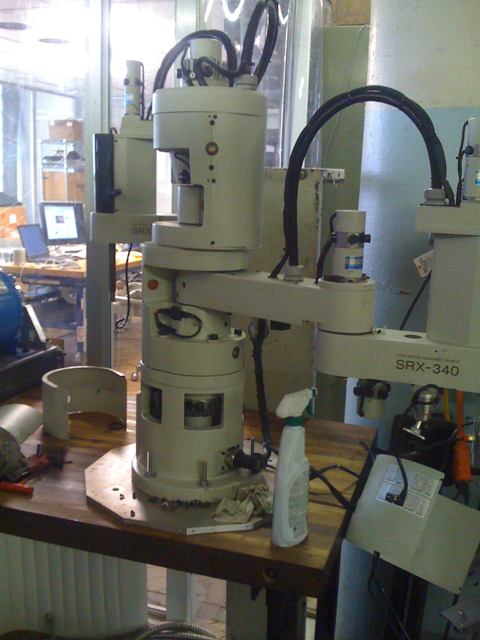 SRX-340: High speed assembly robot. The controller is: DRX double arm robot controller. The equipment is in great shape. The controller turns on, but it seems to be hitting an error with some missing external dependency. Interesting how difficult it is to unlock the value represented by this machine. We can’t find any documentation on google. If you know details, let us know. I ended up using ruby-serial to control embedded code in the Arduino. The problem with the wrong number of steps per revolution was from packet loss, by slowing down my ruby program the error went away. I need to get some more test wire to wind a full torus now! Here are the pieces for the coil winder, partially assembled. Already I can tell the bobbin is not well supported axially. I doubt it will be able to keep tension with 12 gauge wire. But we can test thinner wire on this iteration. Doing some quick checks. The stepper motors are supposed to take exactly 400 steps to complete a revolution. However, when I program the bobbin to take 400 steps forward then 400 steps backward, it appears to come just short of a full revolution! WTF! It looks like it’s closer to 415 steps per revolution. But I can’t trust that number to be accurate over many revolutions. I’m learning RAD, a gem for controlling the arduino from ruby. Very cool.